One of the more frequently asked questions that we get at the Stick and Cane Shop is 'how do I know what length of walking stick I should buy?' Well, fear not, this is quite a simple measurement to make and we will show you how in this week's blog. To measure yourself for a walking stick, the first thing to say is that the length is not directly related to your height. It is a relative measurement that is determined by the distance between your hand and the floor - therefore you can see that this will be a very individual measurement for each person. Step 1 - Stand upright, let your arms relax by your side slightly bent (not locked) while wearing the shoes you would generally use. Step 2 - Enlist the help of another person to measure the distance from your wrist bone to the floor. Step 3 - This will be the ideal height for your walking stick. Step 1 - Stand upright as before, arms relaxed by your side, in your usual footwear. 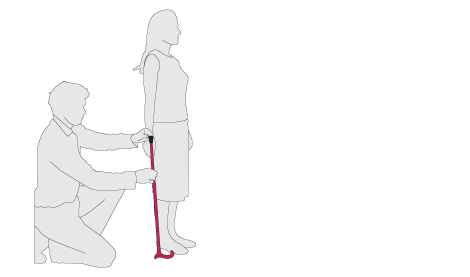 Step 2 - Ask another person to help and hold your walking stick upside down, with the top of the handle touching the floor. Step 3 - Position the ferrule end of the stick beside the arm and make a mark on the walking stick where the shaft of the cane meets the bump of the wrist bone. Step 4 - This mark is where you should cut the walking stick. Step 5 - Make the cut with a saw and reattach the rubber ferrule to the cane. So if you are purchasing an adjustable stick from us, ensure that this height is within the range of the particular stick you are buying. If you are buying a solid walking stick, ensure you take advantage of our FREE walking stick shortening service - just enter the length required in the box at checkout. However please ensure that you get this measurement right, as we cannot accept returns on walking sticks once cut to a bespoke size. Be aware that this is a reference guide only and if require specific advice or have unique mobility requirements, ensure you consult your GP, or physiotherapist first.